Saturday’s matchups are official. 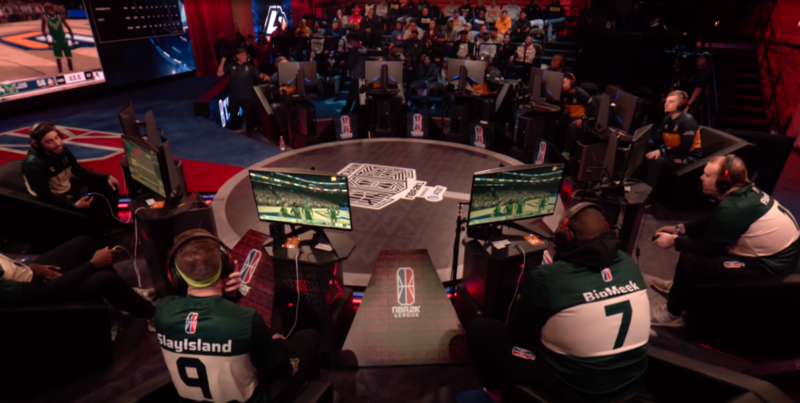 After four days of group play, the final eight teams will battle it out in single elimination format to crown the NBA 2K League season two Tipoff tournament champion. Let’s look ahead and preview what to look for in each matchup. Raptors Uprising GC turned out to be the first and only team to deploy a double-lockdown defender lineup in the group stage of the Tipoff. In both of the Raptors’ matchups, it saw exactly how a game could go when the lineup is clicking on all cylinders and how a game can run away when the lineup strengths aren’t completely maximized. Against Mavs GG, the Raptors converted an astonishing 26 points off of 19 forced turnovers. That same Raptors lineup converted only 2 points off of 11 forced turnovers against Cavs Legion GC. The difference in “defense turned to offense” showed a huge gap in the end result. Raptors Uprising beat Mavs GG, 62-41, then lost to Cavs Legion, 59-47. In the Raptors’ first game against the Mavs, the Raptors jumped out to a 15-point lead at halftime. Then, Mavs GG started off the second half on a 12-0 run to cut the halftime deficit of 15 down to 3. During that Mavs’ run, the Raptors forced 0 turnovers and the offense looked extremely stagnant, showing exactly what this team becomes if its defense isn’t wreaking havoc. Moving on to Magic Gaming, this team looks to be an interesting matchup with Raptors Uprising GC. The Magic were one of many teams to deploy a double-sharpshooter lineup. However, this was expected. The Magic were the only team to win both of its games on day one—even if one of the results remain controversial to some. With both wins, it was impressive to see the Magic prevail from Group 2 with its two sharps, Reizey and KelMav, shooting a combined 31% from 3-point range. Both Reizey and KelMav should come into Saturday looking to bounce back from the lackluster shooting performances. Even with the shooting issues, the Magic still had some bright spots. KingCamRoyalty leads the tournament in rebounds, averaging 19 per game. And UCManny is currently holding opposing guards to a combined 18% shooting from the field. Outside of Manny, the Magic need to find someone who can defend the opposite hash. The Knicks were able to abuse both KelMav and DT on the defensive end for 4 quarters. It’ll be interesting to see how the Raptors utilize All Hail Trey in their matchup as it did prove to be a weak point in the Magic’s defense. Matchup to watch: Raptors’ double locks vs Magic’s double sharps. The Raptors look to thrive off of their defensive efforts. While the Magic’s sharps are still looking to solidify themselves. Keep an eye on these matchups throughout the game. T-Wolves Gaming was definitely the most impressive team in group play. Even if many expected them to prevail from Group 2, it is hard to believe anyone predicted they would be so dominant. The T-Wolves finished group play with a +44 point differential. To put that into perspective, the next closest team in point differential was Warriors Gaming Squad at +19. However, beyond just the total point differential, this T-Wolves team looks to be one of the more efficient teams we’ll see this season. The T-Wolves are currently shooting 61% from 3-point range, tied for most efficient in the league with Bucks GG. Many were interested to see how BearDaBeast23 would be utilized with this team, playing alongside another ball-dominant player in Hood. After seeing the T-Wolves’ first two games, the case could be made that Bear fell into the best possible scenario. Bear and Hood are shooting a combined 58% from three in the tournament. The most underrated aspect of this team is probably the Wolves pick and roll defense, manned by TURNUPDEFENSE and iFeast. Both opposing point guards the T-Wolves faced in group play, Vandi and Demon JT, could never get comfortable when these two were lined up across from them, shooting a combined 36% from the field. With how prolific this team is going to be on offense, it will be interesting to see the ceiling if the defense continues to perform as it did on Wednesday. Then we have the consensus favorites, 76ers GC. Radiant looks to have picked up exactly where he left off in season one. Radiant came out on fire against Heat Check, as he was responsible for 40 of the Sixers 63 points. Radiant also became the first point guard to record a double-double in the tournament. The Sixers, however, did look susceptible to offensive rebounds and second-chance points. Every time the Heat went on a run, it was sparked by a second-chance bucket. Look for the Sixers to address this issue prior to the matchup on Saturday as the Wolves are one of the more efficient teams in the league. This matchup looks to be 4th of July in April. Both organizations should provide the offensive fireworks while each coach tries to outsmart the other. Prepare yourself for an abundance of highlight plays when you tune into this one on Saturday. Matchup to watch: Radiant and Steez vs TURNUPDEFENSE and iFeast. Not only should the T-Wolves consider this specific matchup make or break for the overall win, but iFeast should be foaming out the mouth as he’s ready to go toe-to-toe with his former teammates. Look for this matchup to be the deciding factor in who moves on to the semifinals later in the day. Pacers Gaming is on a mission. This was proven with the wins over Warriors Gaming Squad and Hawks Talon GC. Although the Pacers went 2-0 on the day, there were still some major concerns that should be addressed by Saturday if Pacers Gaming is considering a tournament championship at all possible. The Pacers defense is going to be what it lives and dies by. This was evident coming into the season with a core of WoLF, Ramo, and Swizurk. Yet, the Warriors seemed to find a major exploit in this team’s overall defense. The Warriors easily found the switch on offense to get each respective ballhandler off of WoLF. While Swizurk is arguably considered the best sharpshooter in the league, the Warriors and Hawks were finding open shot after open shot when Swizurk was defending on-ball. Add Profusion from Celtics Crossover into the equation and there could be a major issue. Another concern that could hinder the Pacers’ success is the extreme offensive dry spots it showed in both group games. The Pacers jumped out to double-digit leads in the first quarters of both games. However, both the Warriors and Hawks Talon were able to claw back into the game by halftime. If Pacers Gaming is to win this tournament, it will have to keep the first quarter momentum riding for longer than just six minutes. Celtics Crossover Gaming would argue it’s on a mission, as well. Coming into season two, the Celtics know too well what it feels like to come up short in tournaments. It is yet to be seen if those shortcomings will transition into this year, and that is something to keep an eye on Saturday. But this team’s chemistry on and off the court seems to be night and day compared to last season’s roster. The Celtics look to ride the offense of oFab and Profusion while counting on the overall team defense to provide the necessary stops. The formula seemed to work enough to move the Celtics past the group stage. Fab had his ups and downs on the offensive end but provided enough to get Profusion his touches, understanding he had the hot hand all night. Profusion currently leads the tournament in scoring with 33.5 points per game. The Celtics, similar to the Pacers, experienced its fair share of offensive dead zones as well. After going up 20-8 in the first quarter against Lakers Gaming, the Celtics allowed the Lakers to get back into the game and bring the halftime deficit within two. It will be interesting to see how both teams address the stale offensive issues on Saturday. Matchup to watch: Swizurk vs Profusion. The two best scorers in group play. If the Pacers and the Celtics don’t change anything defensively, it looks like both shooters will also guard each other. It will be interesting to see how both carry their offensive momentum into the next round. Nobody saw Bucks Gaming making it out of Group 7 alive. Yet here they are, on Saturday, preparing to go head-to-head with the runners-up from season one. It’s no secret that this team is an underdog. By all accounts, they probably understood that coming into group play on Friday too. But as soon as the ball was tipped off, they threw every Buster Douglas uppercut they could until Blazer5 Gaming finally hit the canvas (or hardwood). The Bucks brought a poised energy to the stage. Plondo was significantly outplaying the reigning MVP and DPOY, OneWildWalnut, and seemed to never even say a word to him. While the backcourt of ChaddyNick and ARooks combined for a total of 42 points—only second to Celtics Crossover’s oFab and Profusion, who scored 55 against Pistons GT—the two carried a swagger as if they knew this would happen. The Bucks are shooting 62% from the field and 61% from 3-point range. Those are the most efficient shooting numbers of any team in group play—tied with T-Wolves Gaming in 3-point percentage. There wasn’t a power ranking that was released before this tournament that had the Bucks any higher than 19th overall. Now the Bucks are one of the final eight. Quite the turn of events. Heat Check Gaming seems to be on the other side of the spectrum. Its road to Saturday wasn’t the prettiest, but this is exactly what you’d expect from it. The Heat lost its first game to Sixers GC in an electric battle of a season one semifinals rematch. The new-look Heat came out trying to make a statement. Yet every time it’d make a run, the Sixers had an answer. The silver lining of the unfortunate result, however, was the Heat walked away from the matchup with three points after winning three quarters. Those three points proved to be vital to Heat Check’s wildcard bid. Adding to the seven points from its win over the Kings, the Heat stood firm at 10 total points to qualify for the wildcard spot. It’ll be interesting to see how this Heat team matches up with the Bucks. The Heat are definitely one of the more vocal teams while the Bucks are the complete opposite. However, the Bucks were able to keep Blazer5 pretty quiet all game. Look to see how each team’s energy factors into the gameplay. Matchup to watch: Lotty vs. Bucks backcourt. The X-factor for this Heat Check team will be Lotty. He wasn’t able to contain Radiant enough in Heat Check’s loss to 76ers GC, but he played extremely well against BP in the Heat’s victory against the Kings. With ARooks currently averaging 24 points per game, and ChaddyNick showing he can drop 20 as well, look for this matchup to be a huge reason each respective team wins or loses.